This product is discontinued and not supported anymore. Try the new DestroY MediaPlay. If you still have any doubts about DestroY MP3 Player don't doubt in asking. as big players. It features all you can ask for in a MP3 Player!!! * Best of all.. IT's FREE!!!! the actual one on program load. * Bugfix: DestroY MP3 Player won't close anymore when pressing the ESC key. * New Green Force skin added. * Bugfix: The playlist will now save in the aproppiate file format. * Right click menu with MP3 controls, Previous/Next list controls and more features. 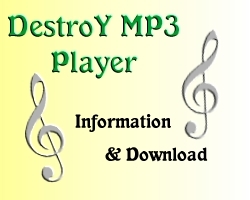 * Ability to control DestroY MP3 Player from the systray. * Search your hard drive automatically for MP3 files. - The Playlist won't appear if you left the playlist Off in the last execution. - The Paths/Name button won't disappear if you choose Paths in your last execution anymore. - The Paths/Name button won't be inverted anymore..
- The Playlist On/Off button won't display "Playlist Off" while on the Options menu anymore. automatically so you don't need to re-config each time you open the player. * Ability to minimize to tray or taskbar. * New snap to edges function/option. * New always on top option. * New Mini MP3 Player. * Full install and unistall support. * Added a slider to control the volume. Minibrowser and won't "cut" the Thinger and the Playlist when comming back from the About. This bug was found on people that never used the Playlist On/Off button. and the About and deleted the actual playlist. * New playlist with editor on main window, list search and lots of new functions. * Progress bar to show how much % of the song was played. * Now when typing a URL on the Minibrowser the Enter key does the same as the Go! button. Windows XP if you have problems select compatibility mode "Windows NT 4.0 (Service Pack 5)". This software is freeware and you can feel free to distiribute it and use it without any charges. ©2003-2016 DestroY Software. All Rights Reserved.